We provide both public and private onsite workshops on various areas of software engineering, including how to adopt Agile methods within organizations and teams, for improved team performance, better product quality, and overall business success. At Plannow Technologies we focus strongly on the practical side. We train you and show you via hands-on case studies how it is done. Our workshops are a blend of short theoretical concepts, immediately followed by the practical implementation of those principles. We don’t concentrate on providing academic knowledge, but strive to instil in you the principles, tools and techniques that will allow you to apply what you have learnt the very next workday. Our certified trainers will ensure that you have complete understanding of the subject matter by the end of the workshop. Agile methodologies are quickly becoming the standard way to develop and manage software products. 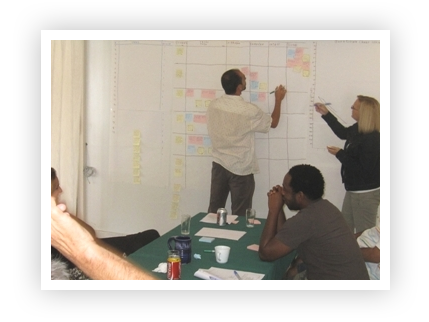 We provide hands-on Agile training. Plannow Technologies offers public workshops and private on-site training workshops. What is agile planning? Why are there so many planning sessions? What are story points and how are they different from estimating in ideal days? All these questions will be answered in this highly collaborative session. This workshop will take participants through all the planning and estimating ceremonies in Scrum, highlight the roles and responsibilities of product owners and scrumMasters , and will demonstrate how Agile teams work together to deliver high quality products. In this workshop we focus on the methods and techniques business analysts should master in order to be successful in developing solid use cases. Basic and advanced use case concepts will be discussed, including the Unified Modeling Language (UML), the use case model and actors. A running case study will be used to take participants from start to finish through a project that utilizes use cases. In this workshop, we will look at how to identify and write effective requirements through user stories. We will discuss how user role modeling will help you in identifying contextual user stories. During this hands-on workshop you will have the opportunity to practice identifying user roles, eliciting and writing business requirements (user stories) on a case study. Through this hands-on course you will learn, from experienced Agile practitioners, various techniques and practices that can help you succeed in your software development projects, using Scrum and Extreme Programming principles. The workshop will focus on how an organization can implement Agile practices in such a way that it does not paralyze the company. Contact Plannow Technologies for any service or product related request.